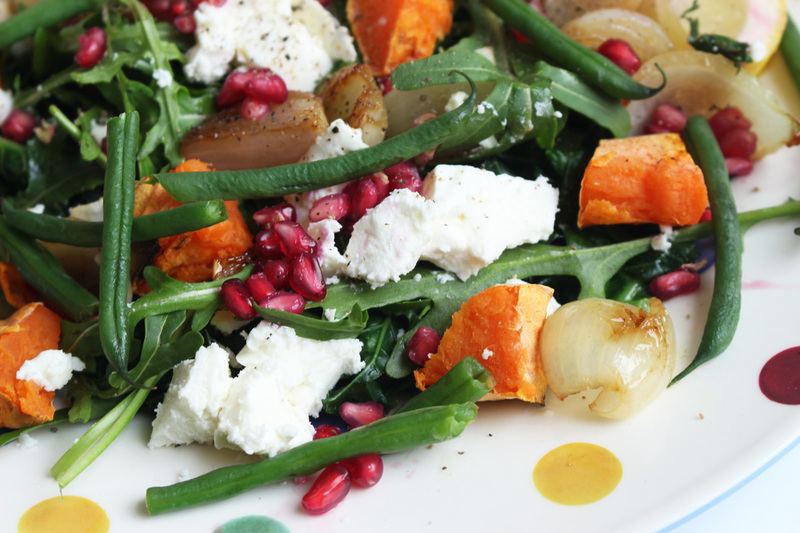 I adore salads, but when it comes to the cold Autumn/Winter months, I like to serve them warm for a more comforting feel. 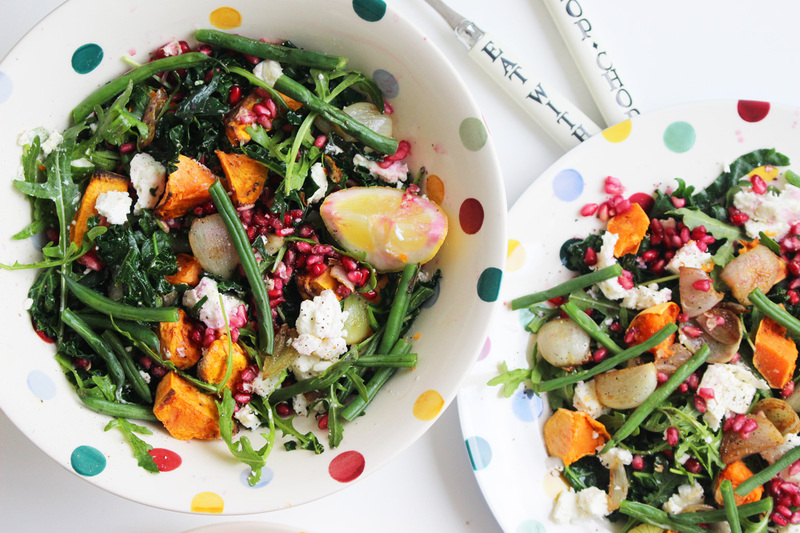 One of my favourites is this kale and sweet potato recipe with green beans, pomegranate, feta (vegan), rocket, caramelised shallots and the most simple dressing! 1. Peel and cube your sweet potato. Put it on a baking tray and drizzle with olive oil. Add salt & pepper, bake in a preheated over at 220 degrees C for around 20 minutes. 2. Steam your green beans (or cook them in water). They're optional, as the salad tastes amazing without them too. I just love green beans. 3. Next, quickly stri-fry your kale in a pan in a little bit of butter. Once the pan is hot, add some water to blanche the kale to make it nice and soft. Sprinkle a little bit of brown sugar for sweetness. Put it in your serving bowl and set aside. 4. In the same frying pan, melt a tablespoon of butter and throw in your shallots cut into quarters. Once the shallots seem soft, add a tablespoon of brown sugar and let it caramelise. Set aside. 5. Prepare your pomegranate seeds. Make sure to keep all the juice as you will need it for the dressing. 6. Crumble or cube your vegan feta cheese. 7. Dressing - mix your pomegranate juice with a juice of half a lemon in a little bowl, adding a little bit of golden syrup, salt and pepper. That's it! 7. Time to assemble the salad! Toss the kale with fresh rocket in the bowl. 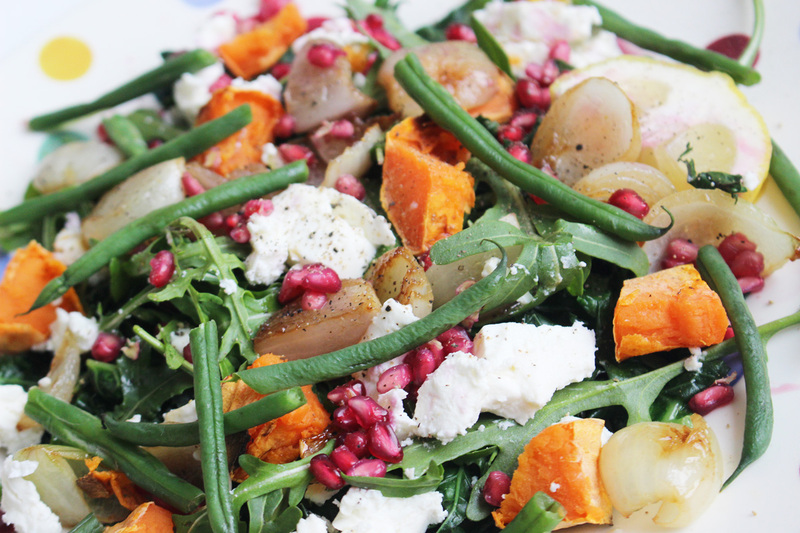 Add your sweet potato, feta, caramelised shallots, green beans and sprinkle pomegranate seeds on top. Pour the dressing allover the salad and toss. 8. 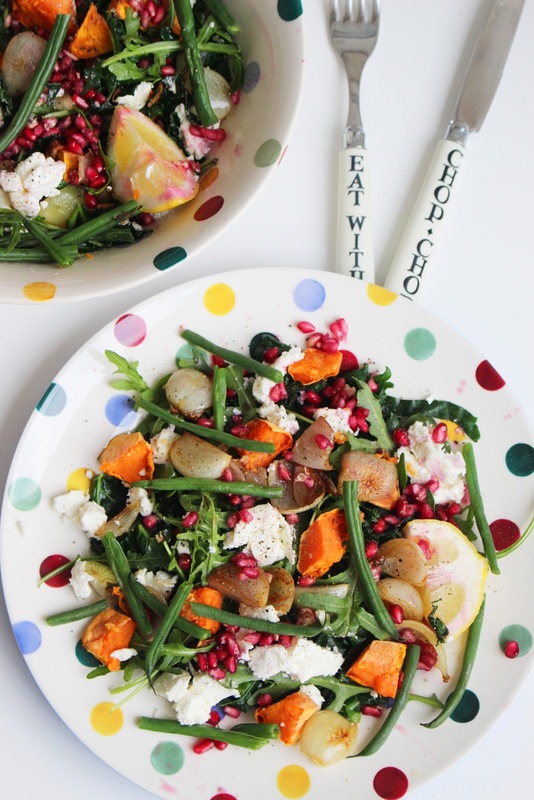 You can also add some chopped up mint to switch it up a bit, as it tastes amazing in salads. Again, it's optional, as I know that not everyone likes it. I LOVE IT! You all know how much I love my Emma Bridgewater, so it's no surprise that I served this lovely salad on some gorgeous polka dot pieces! Serving bowl (£49.95), plate (£9.00) via www.lovethesales.com. So pretty, right? 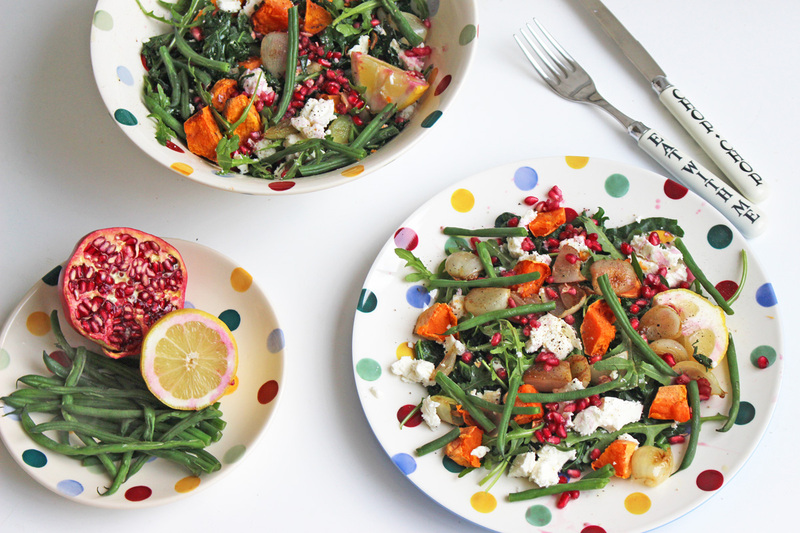 And the colourful dots go so nicely with the ingredients of the salad! It's such a lovely, warming recipe full of goodness! 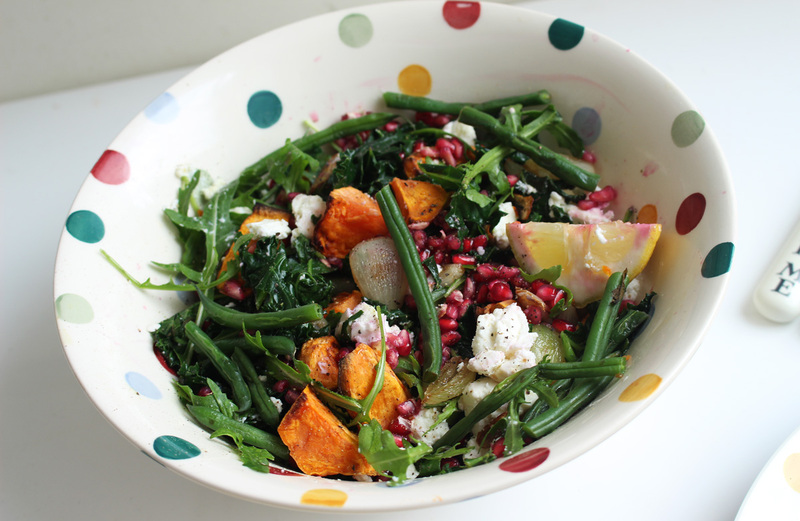 Your 5 a day in one dish which is my favourite kind of meal. Just look at all the colours! Beautiful! Will you give this recipe a go? It's so quick and easy!